New York City’s ‘High Line’ is a one mile linear park built on a former elevated railroad track, which runs along the lower west side of Manhattan. The former railroad track was redesigned and planted as an aerial greenway, for New Yorker’s to enjoy. Hatzel & Buehler was awarded the electrical contract for the High Line’s Maintenance and Operations Facility. Located in the Meatpacking District of Manhattan, the four-story building resides next to the High Line park and provides indoor facilities for the High Line’s maintenance crews, volunteers and visitors. 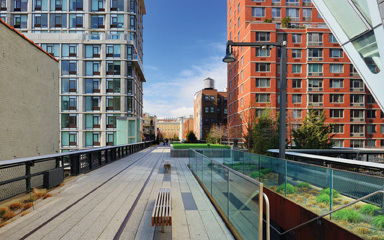 To seamlessly integrate the environmental and sustainable design interests of the park creators, the High Line’s Maintenance and Operation’s facility aims to acquire LEED Silver Certification upon its completion.